We have also included a limits calculator at the end of this lesson. This math tool will show you the steps to find the limits of a given function. The following table gives the Existence of Limit Theorem and the Definition of Continuity. Scroll down the page for examples and solutions. if we can make the values of f(x) arbitrarily close to L by taking x to be sufficiently close to a (on either side of a) but not equal to a. This says that as x gets closer and closer to the number a (from either side of a) the values of f(x) get closer and closer to the number L In finding the limit of f(x) as x approaches, we never consider x = a. In fact, f(x) need not even be defined when x = a. The only thing that matters is how f(x) is defined near a. 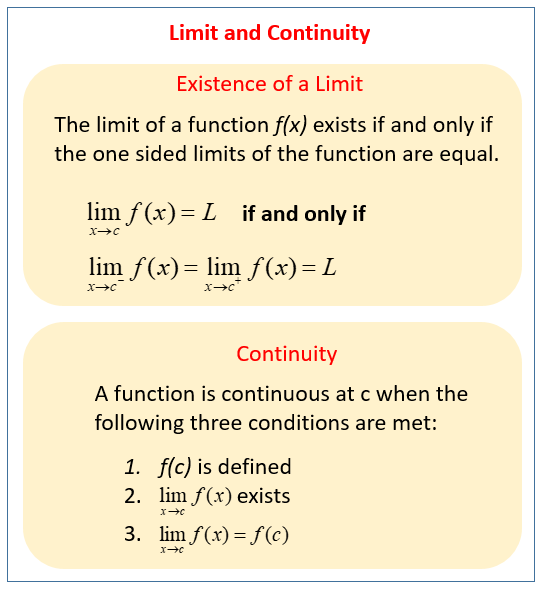 Basic idea of Limits, informal definition of Limit, and what it means to calculate a limit. What is the Limit Theorem? As x approaches c, the limit of f(x) is L, if the limit from the left exists and the limit from the right exists and both limits are L.
How to calculate the limit of a function using substitution? Functions with Direct Substitution Property are called continuous at a. However, not all limits can be evaluated by direct substitution. The following are some other techniques that can be used. Note: In the above example, we were able to compute the limit by replacing the function by a simpler function g(x) = x + 1, with the same limit. This is valid because f(x) = g(x) except when x = 1. How to calculate a Limit By Factoring and Canceling? How to calculate the limit of a function by using the factorization method? If there are fractions within fractions, try to combine the fractions. We cannot use the substitution method because the numerator and denominator would be zero. How to calculate a Limit by getting a Common Denominator? If there is a square root, try to multiply by the conjugate. How to calculate a Limit by multiplying by a Conjugate? A Limits Calculator or math tool that will show the steps to work out the limits of a given function. Use it to check your answers.